On 7 and 8 February 2019, hundreds of people joined us (in person and via livestream) for the third edition of YoastCon. YoastCon is an SEO conference that goes deeper and wider than most other SEO conferences. 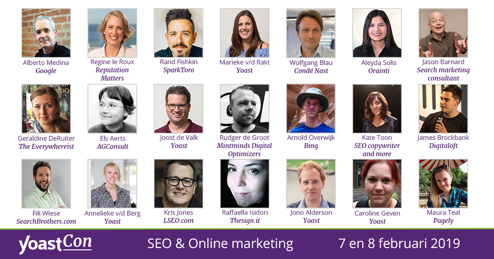 YoastCon is an SEO conference about different elements of search engine optimization, including workshops, in English and in Dutch. Renowned SEO experts shared their experience and allowed visitors to take home the knowledge they need to get better rankings for their sites. Read all about this latest edition of YoastCon or read about Yoastcon 2015 or Yoastcon 2017. YoastCon 2019 took place on 7-8 February 2019 in De Vereeniging in Nijmegen, The Netherlands. This time it was a two-day conference, unlike 2015 and 2017. YoastCon 2017 was the first time we hosted YoastCon in the beautiful venue that is De Vereeniging in Nijmegen, on the 2nd of November 2017. Wednesday the 27th of May 2015, Yoast hosted YoastCon for the very first time, in de Lindenberg in Nijmegen: YoastCon 2015.